The early reactions to the outcome of the U.S. presidential election have been similar to what we saw after the vote by the United Kingdom to leave the European Union (Brexit). 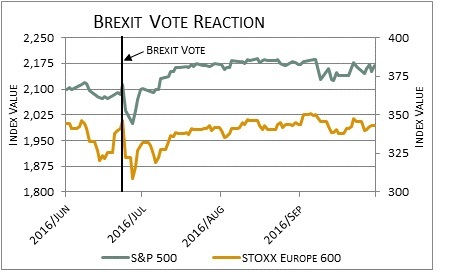 The chart below depicts the quick and sharp negative reaction to the surprise vote. However, financial markets quickly recovered after the initial emotional reaction. Early reactions to the U.S. election result are following a similar path. Overnight and early this morning U.S. stock market futures and the dollar fell sharply as it became clear that Donald Trump had won the election. Stock futures were down as much as 5%. Gold rose as much as 5%. The 10-year U.S. Treasury bond yield initially declined (and price rose) to 1.74% after closing Tuesday at 1.87%. By early this morning the yield rose (and price declined) to 1.978%. These initial reactions were due to the surprise factor. Financial markets expected a Clinton victory. Reactions calmed somewhat by the time U.S. markets opened this morning. Stocks were actually higher at the open this morning. We expect there will be bouts of volatility as market participants grapple with the uncertainty about what a Trump presidency means for key policies such as trade and taxes. We remind you that it is best to avoid emotional reactions during times of volatility and to rather focus on long-term investment objectives.